Well, yes, I exaggerate. 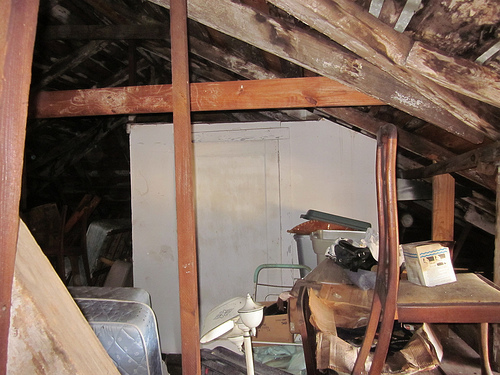 But by far the greatest number of calls from potential donors start out with “We were cleaning out the attic at my (choose your relative)’s house.” If it sounds like something we might want, I check with Kris and we arrange to go see it or have it brought in. If it doesn’t fit our collections parameters, I suggest other museums that might take it. If the caller wants to know something about the value of an item, particularly if they plan to donate it, I am forbidden by museum ethics to give them an appraisal. We keep a list of appraisers and websites to which we refer them. If they just want to know what something is, I try to help them over the phone, but if I can’t, I either have them bring it in or I try to suggest somebody else to help them. Another common type of call is from a person wanting to know how best to preserve a family treasure. I try to find out as much as I can – what the object is made from, what condition it’s in, what the person wants to do with it. I also ask whether the area they want to store it in is heated and air conditioned, and what kind of light it has. It’s a ticklish situation sometimes, because I have to try to get an idea over the phone about whether the person is willing or able to spend any money on specialized storage materials. If so, I suggest what they might need and give them information about where to get it. If not, I often resort to the old quilt-in-a-pillowcase strategy. There’s also the zip-loc- bag strategy, the if-you’re-comfortable-it’s-probably-comfortable-too strategy, and the anything-but-cardboard-boxes-in-the-attic-strategy. I usually try to convince them that washing or polishing up something frequently does more harm than keeping it in less than ideal conditions. If I find I need to do more research myself, I tell them I’ll call back. And I do. I even got myself into a volunteer gig of my own through a phone request for information. Later this month I am going to a small local museum to teach their only paid staff member and some of their volunteers how to mark objects. I love helping people with these things, but it takes time. And I’ve got to go update the database. Hi, just wanted you to know that I love your articles, the way you tell a story and the story itself. Hola, solo para que sepan que amo vuestros artículos, el modo como cuentan una historia, y la historia en sí misma. Muchas gracias, Claudia. Tus comentarios son bienvenidos, así como los aportes que tengas a bien dar para nuestro blog. Thank you very much, Claudia. Your comments are welcome, as well as the contributions you have to either give to our blog.